Dates with Destiny: Paper Chef #7 Has a Winner! The beauty of Paper Chef rests, of course, on the remarkable ingenuity and high culinary standards of its participants. As you may know, this monthly food blogging event is the brainchild of the tireless Owen at Tomatilla (who is also the daddy of Digital Dish). As last month’s winner, the task falls to me to judge this month’s round-up. The seventh edition is certainly no exception to the creativity and overall deliciousness we’ve seen in the past. The fun part of this round was the discovery of such a wide range of dishes using the specified ingredients (Medjool dates, honey, buttermilk and eggs). We have truly been presented with a dazzling array of both sweet and savory courses. Many have commiserated with me on the difficulty of my task. As nearly all the previous judges have noted, it just ain’t easy. Sixteen splendid entries have appeared, all using the stated ingredients in tempting plates ranging from puddings to pot pies. As far as I can tell from combing the archives, this is the greatest number of participants yet for a Paper Chef event. Like the food-blogging community, Paper Chef just keeps on growing; kudos once again to Owen for providing us with ongoing fun and a sterling round-up each month. After reading all the entries carefully, I asked myself just one question: which of these would I most like to eat? I have to say that I would have been happy to have many of these dishes appear magically in front of me – but one really stood out. 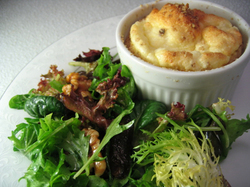 This month’s winner is Sarah of The Delicious Life, for her Feta Soufflé with Walnuts, Dates and Feisty Greens. She spun a sultry tale of last-minute haste due to an unexpected weekend date of her own. Despite this, she managed to combine the other kind of dates, the chewy ones, along with the rest of the required elements, into a petite yet seductive plate that had my tastebuds singing simply from the description, not to mention the delectable photo. And all this happened while she underwent her virgin attempt at souffléing -- so to speak. As many of you have hastened to tell her – don’t worry, Sarah, it gets even better. Seriously, this sounds like the sort of perfect first course one might find on the menu of a favorite restaurant. I think it would also make a delightful guest lunch or light supper. I love ricotta cheese, especially in desserts. And I'm very fond of almond paste, having been a marzipan fan from way back. White chocolate, well...not so much. I'm definitely a "darker-the-better" girl when it comes to chocolate. But I can work with it. Strawberries are all about celebration and the year's entry into summer. So I was pretty excited about the ingredients for my first go at Paper Chef. The only glitch, of course, is that strawberries don't really come into season here in the Northeast until mid to late June. There are plenty of strawberries in the markets that have taken the long cross-country trek from Watsonville, but they vary greatly in flavor, bouquet and texture. Owen of Tomatilla, Paper Chef's creator and host, kindly suggested that those who live in regions where strawberries weren't yet available could use something else. But I didn't want to take the out, since strawberries actually are available to me, although not yet very delicious. So I came up with a Strawberry Rhubarb Compote, a preparation that I hoped would coax the non-local strawberry's still hidden scent and flavor out into the open. I used a supporting cast of ingredients that complement strawberries, and make them taste even more of themselves: rhubarb, Grand Marnier, and fruit vinegar. The other trick I used was to cook half of the berries with the rhubarb, which released their luscious taste. Then the rest of them were added fresh for color and texture, once the compote had cooled. The juices were reduced to a fragrant syrup and drizzled over the whole. I thought about floating sweet little ricotta dumplings with almond and white chocolate on top of this compote. But somehow a warning voice told me that this was a recipe for disaster, as I suddenly envisioned the dumplings either falling apart in the liquid, or being tough and glutinous. Next I thought of a ricotta custard, but then decided I didn't want anything too cheesecakey. Then it came to me: Ricotta Gelato! This would be a perfect place to incorporate the white chocolate too, giving some body to the gelato. Now for the almond paste. A cookie or cake would be just right on this plate -- and what better than my favorite Scented Madeleines, butter-rich, moist with almond paste and perfumed with orange-flower water? Preheat the oven to 375 F. Trim and clean the rhubarb, cut into 1/2 inch lengths, and put into an ovengoing dish. Sprinkle with the sugar. Add half the strawberries, reserving the other half. Mix the Grand Marnier, vinegar and honey, and pour over the fruit. Mix everything together, cover the dish with aluminum foil, and bake for 1/2 an hour, just until the rhubarb is completely tender. Let cool. Drain the fruit carefully, reserving the juice, and put it back in the dish. In another pan, reduce the fruit juices by half, until they're thick and syrupy. Place the remaining strawberries with the cooked fruit, and pour the warm syrup over everything. Mix lightly, and chill until ready to serve. Place the sugar and water in a small saucepan. Bring to a boil over medium heat and cook until the sugar is dissolved, about 3 minutes. Remove from the heat, and add the chocolate. Whisk lightly until the chocolate is melted and incorporated into the syrup. Process the ricotta in a food processor fitted with the steel blade until very smooth. Add the white chocolate syrup and all the other ingredients and pulse the machine a few times to blend well. Refrigerate until the mixture is very cold. Pour into an ice cream freezer, and freeze according to the freezer's directions. This recipe was given to me by my lovely friend Ernestine, who assured me that these are the best madeleines ever. They've certainly become my favorite. She also told me that they stay fresh longer than the plain kind, especially if well wrapped and put in airtight packaging. I found that they freeze beautifully, too. Ernie got the original recipe from The Silver Palate Good Times Cookbook. 1. Cream the almond paste and sugar in a food processor fitted with a steel blade. Transfer to a large mixer bowl and add the eggs, one at a time, beating well after each addition. Add the almond extract and the orange-flower water and beat until light and fluffy, 1 to 2 minutes. 2. Sift the flour and baking powder together and fold lightly into the almond mixture. Gently fold in the melted butter just until combined. Refrigerate the batter for at least 1 hour. 3. Preheat oven to 400 degrees F. Brush madeleine molds with melted butter and dust lightly with flour. 4. Spoon the batter into the molds, filling them three-fourths full. Bake until lightly colored, 8 to 10 minutes. 5. Let cool for 5 minutes, and then gently remove to wire racks to cool completely. Allow the molds to cool before rebrushing with melted butter and repeating the process with the remaining batter.